Crisp and light and sprinkled with powdered sugar, Grandma’s angel wings were a beloved, although a bit messy, holiday treat. They always left sugar trails on the tablecloth, like a dusting of snow. There was no hiding the evidence; the more of the delicate, golden cookies you ate, the more it mounted on and all around your plate. Of course, it’s practically impossible to eat just one. 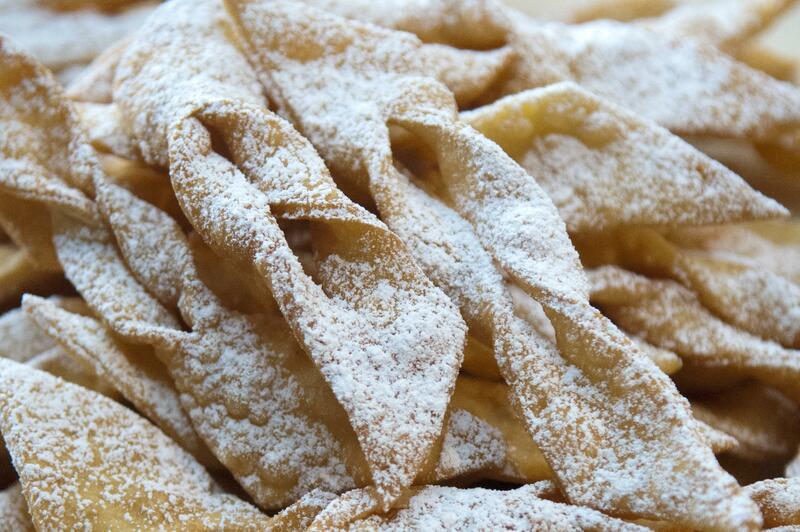 Folded into the shape of bowties or “angel wings,” chrusty (pronounced HRROOSS-tee) are traditional Polish cookies similar to French bugnes, found in pastry shops for Fat Tuesday, the feast before the fasting of Lent. Many European countries – Bulgaria, Belarus, Lithuania, Ukraine, Slovakia, Croatia, Sweden, Denmark – make similar knotted pastries. I always thought they looked like the bows topping presents. Grandma’s cookies, also known as chrusciki (hrrooss-CHEE-kee) or faworki (fa-VOR-kee), truly were little gifts. The powdered sugar melts in your mouth as you bite into the blistered, fried pastry dough. Slightly sweet with a satisfying crunch, chrusty are typically served at Christmastime, Easter, weddings, birthdays, other special occasions and, sometimes, just coffee. Grandma made dozens at a time, storing the cookies in 3-pound, metal coffee cans. At Christmas, she put them in cardboard Quaker oats containers, which she covered with wrapping paper and gave away as gifts – mostly to in-laws and granddaughters’ boyfriends. If you weren’t lucky enough to have a Polish grandmother like I was – and Martha Stewart, too – you’re in luck; chrusty aren’t difficult to make. They’re just a little time-consuming, especially when folding and frying them in large batches. Grandma did all of her baking and pastry-making in large batches. I remember watching her in her butter-colored kitchen, rolling the dough with a wooden rolling pin and what seemed like such great strength. She worked quickly, expertly cutting slits in the center of each elongated rhomboid, then tucking the thin dough into itself and letting it dangle from her hand for a moment for a little extra stretch. She placed each pair of “wings” in long and perfectly straight lines, waiting for their swims in a pot of hot oil. Grandma preferred Wesson. I remember the sizzle of the chrusty – I pronounced it “croostie” back then – as each cookie crisped. It seemed like forever waiting for the oil to drain and the chrusty to cool before coating the cookies with powdered sugar. But Babcia doesn’t cook like she used to. All of that mixing and rolling and folding and frying is too much for her nearly 87-year-old hands. She hasn’t made chrusty in years. A year or two ago, she gave me her recipe, handwritten and in Polish. I used an online site – along with help from some folks on Instagram – to translate it only to find she had left out the flour. “Flour, I don’t measure,” she later told me. Her recipe also called for 12 jaj, or a dozen eggs. That sounded like a lot. So, for my first attempt, I used Martha Stewart’s recipe. It didn’t go over well. I wasn’t. This was my first batch. But I could tell from the get-go they weren’t quite like Grandma’s. They were a bit chewy, almost cake-like. Perhaps I didn’t roll the dough thin enough? Or perhaps the oil wasn’t hot enough? Or maybe Grandma was right: too much flour, not enough rum. Grandma doesn’t drink. She only used alcohol in her cooking or baking. If she didn’t have rum, she used vodka. If she didn’t have rum or vodka, she used whiskey. She also used heavy cream or half-and-half instead of sour cream. And she didn’t bother with any extracts or zests. Babcia’s recipe was basic. Martha’s recipe comes from her mom, the late “Big Martha” Kostyra. It includes additional flavorings: lemon and orange zest, and lemon, orange and vanilla extracts. Other recipes I found online call for almond extract and brandy. Martha used a fine-mesh sieve to dust the cookies with powdered sugar before placing them atop a cake stand. A tea infuser with a handle works, too. Grandma used a white plastic sifter and served her chrusty on a crystal platter. Shaking them in a brown paper lunch-size bag with powdered sugar also gives them a good, even covering. Any way you sugarcoat them, chrusty offer a taste of the old country. Babcia forcibly left Poland when she was 10 years old. After surviving a labor camp in Siberia and displaced persons camps on two continents, she arrived in the U.S. as a young wife and mother in 1952. Grandma, Grandpa and Mom, then a toddler, arrived in Spokane by train and lived for a short time with a sponsor on a farm near Almira before settling in Seattle where Grandpa had a sister. I’m the oldest grandchild and, these days, the only one in the family who’s making chrusty. At Thanksgiving this year, Grandma gave me her powdered sugar sifter. It’s white, plastic and completely ordinary. But it symbolized the passing of the torch and tradition. We also talked about her recipe, and when I made my second batch in mid-December, it resembled – and tasted like – Grandma’s chrusty. New cookies are winding their way to her in the mail for Christmas, and I’m awaiting Babcia’s verdict. Beat eggs in bowl of an electric stand mixer with whisk attachment. Gradually add sugar, butter, salt and vanilla, beating mixture until light and fluffy. Add rum and cream, and continue beating until mixture is thick and well-incorporated. With dough hook, mix in flour in small amounts, about ½ cup at a time, until well-combined and dough is elastic. Divide dough into four balls. On a floured surface, give dough ball a few good whacks with rolling pin then knead dough for about 3 minutes. Use rolling pin to roll out dough into a long rectangle shape. “Roll real thin,” Grandma said – an 1/8 of an inch or less. Thinner is better. Use a rolling pizza cutter to cut dough into 1 ½ -inch strips. On the diagonal, cut dough to make pieces that are about 3 ½ inches long. With a sharp knife, cut a small slit, about ¾ of an inch, in the center of each piece. Gently lift each piece, then tuck one end into the slit by folding it over the top of the cooking and pulling it through. Let cookie gently dangle for a couple of seconds to elongate and shape the cookie. Fry chrusty in small batches, 5 or 6 at a time. Use tongs to flip cookies once. They are done when they are golden and blistered, not brown. Drain and cool on a baking sheet lined with paper towels. When completely cooled and dry, dust with powdered sugar. Store in airtight container up to a week. Notes: Grandma’s original recipe called for ¾ cup butter and no vanilla. She also did her whisking by hand and dough-cutting with a knife. I’ve made this dough without the sugar with good results. For additional flavor, add 1 teaspoon of almond extract – or 1 teaspoon each orange and lemon extract, plus 1 tablespoon each orange and lemon zest a la Martha Stewart.